Alpha Delta Gamma is Founded on Five Basic Principles, Known as the 5 S's: ﻿﻿Scholastic﻿﻿, School Spirit, Service, Spiritual and Social. Today, Alpha Delta Gamma holds these Five Basic Principles in high regard. Each Chapter tries their best to complete many aspects of the Five S’s during the course of the school year. Most importantly, Alpha Delta Gamma still remembers the true reason why its Founding Fathers started talking that pivotal day in 1924; and this reason is TRUE BROTHERHOOD. One will not find a closer Fraternity of friends and Brothers around the country than Alpha Delta Gamma. In this National Organization, one is known by his face and his name not a number. Due to this, a man can make a name for himself in this Fraternity; while making close friends with members from all around the country. Such uniqueness evolves from being an Alpha Delt. It warrants a question: How genuine would it be to meet another Alpha Delt in this world, compared to meeting one of tens-of-thousands of another organization? It makes one wonder why gentlemen would choose otherwise. ﻿ALPHA DELTA GAMMA ﻿was founded on October 10th, 1924 at Loyola University in Chicago. Founding Fathers Francis P. Canary, John J. Dwyer, William S. Hallisey and James C. O'Brien were on Chicago's "L" (the elevated railway) when they first conceived the idea of establishing a new fraternity, unique in its ideas and aims. The “Founding Four” envisioned a new concept in fraternities – one based upon the traditions, ideals of true brotherhood, and missionary zeal of Ignatius Loyola, Francis Xavier and Issac Jogues. They saw five specific areas of development for students at Catholic colleges- the spiritual, the scholastic, service to college and community, encouragement of school spirit among fellow students, and the social. In effect, they wanted a fraternity founded upon Christian ideals of true manhood, sound learning, and the unity of fraternal brotherhood. These ideals were decreed the purpose of Alpha Delta Gamma when it first came into being. And so, Alpha Chapter was formed and ADG was on its way to becoming a City Walled! 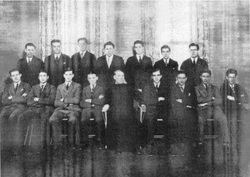 The purpose of this Fraternity shall be: to unite congenial-minded men in a Brotherhood of love and high respect; to develop the highest Christian ideals of manhood among its members; to foster the interests of every institution of learning which it shall be affiliated; to promote scholarship among its members and their fellow members; and to further promote service of community so as to awaken in ourselves and our fellow man a realization of the Brotherhood of man. Man was created to praise, do reverence to serve God, Our Lord, and thereby to save his soul; and other things on the face of the earth were created for man's sake and to help him in the following out of the end for he was created. Hence, it follows that man should make use of creatures so far as they do help him towards his end, and show withdraw from them so far as they are the hindrance to him with respect to that end. Wherefore, it is necessary to make ourselves indifferent toward all created things in whatever is left to the liberty of our free choice and it is not forbidden so that we, on our parts, should not wish for our health rather than sickness, for riches rather than poverty, for honor rather than ignominy, for a long life rather than a short life, and in all other matters so desire and choose those things which may better lead us to the end for which we were created. © 2017 Alpha Delta Gamma National Fraternity. All Rights Reserved.